I’m thrilled to share this wonderful plan again this month from SwtBlessings.com. You can visit the author’s website by clicking here, and make sure you check out her Etsy store for some wonderful prayer cards to print out – I’ve got mine in my cart and about to hit the “pay now” button! 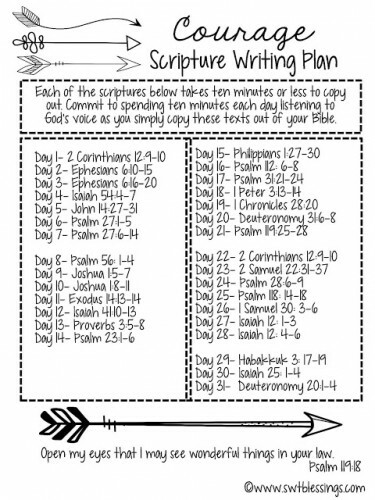 Links to printable files for the Scripture Writing Plan are below. Click here to open a printable version of this writing plan in English. Click here to open a printable version of this writing plan in Spanish. To download the Courage Plan in English, please click here. To download the Courage Plan in Spanish, please click here. Images and PDF files are generously offered courtesy of their creator, Shannon, at SwtBlessings. Please support her by visiting her blog. 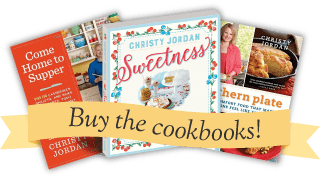 Thanks for the recipes and the Scripture plan! A wonderful way to start out the year! Thank you Christy. Love this…..
Great! I am passing this on to the women at my church. Happy New Year! Love, love, love! Wonderful way to start the New Year!!! 🙂 I hope you have a blessed New Year Kathy! 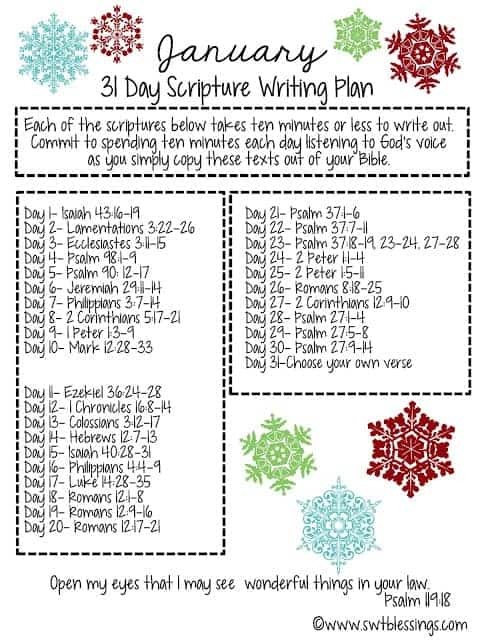 Will you be posting a new scripture plan each month? That’s such a good idea. Thank you Christy, I love this idea. I have printed it out and will put it by my Bible. Please tell me you will be posting a new scripture plan each month. This is awesome. Hey Melinda! Thank you! I love these, too. I’ve already posted an entire year’s worth and the great thing is that we just go back over each month after that, so we’re already covered. The author is adding in special writing plans that go along with themes some months, though, so I am adding those in to “refresh” the plans a bit each month as well. Make sure you subscribe to my newsletter to get it in your inbox each month. Scripture writing has made such a huge difference in my life! There is a colon in there that you may not be seeing. Peter chapter 1, verses 1-4 and Peter Chapter 1 verses 5-11. Hope this helps! I pray you and yours are blessed and highly favored as well Deborah! !